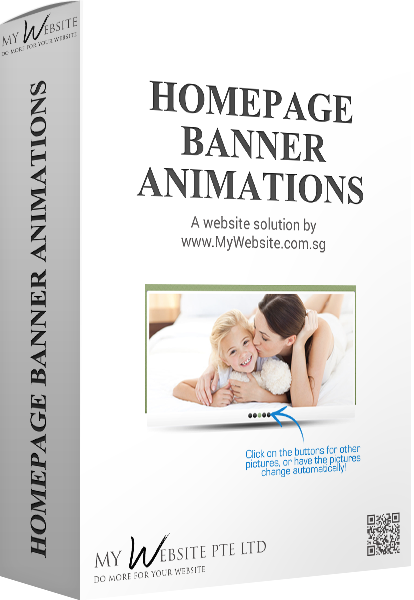 A home page banner animation is almost the very first thing that your customers will see when they land on your website. You can say that it's also an important part of the home page because a home page banner animation is usually at the top of the home page, and it is an animation with images of your products and/or services flashing. Thus, it normally attracts the attention of your users. i. Spice up the home page. An animated banner is definitely more eye-catching than an image that does not animate (move). ii. Gives more attention to your products and/or services. iii. By changing the images in the animated banner regularly, it gives a refreshing impression to your customers and they will keep visiting your website because they know you update it. iii. Low maintenance- Low cost for changing the images. Price stated is for maximum 8 images per animation.